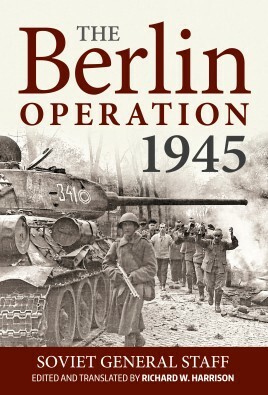 Berlin Operation, 1945, tells the story of the Red Army's penultimate offensive operation in the war in Europe. Berlin Operation, 1945, tells the story of the Red Army’s penultimate offensive operation in the war in Europe. Here the forces of three fronts (Second and First Belorussian and First Ukrainian) forced the Oder River and surrounded the defenders of the German capital, reduced the city and drove westward to link up with the Western allies in central Germany. This is another in a series of studies compiled by the Soviet Army General Staff, which during the postwar years set itself the task of gathering and generalizing the experience of the war for the purpose of training the armed forces’ higher staffs in the conduct of large-scale offensive operations. The study is divided into three parts. The first contains a brief strategic overview of the situation, as it existed by the spring of 1945, with special emphasis on German preparations to meet the inevitable Soviet attack. This section also includes an examination of the decisions by the Stavka of the Supreme High Command on the conduct of the operation. As usual, the fronts’ materiel-technical and other preparations for the offensive are covered in great detail. These include plans for artillery, artillery and engineer support, as well as the work of the rear services and political organs and the strengths, capabilities and tasks of the individual armies. Part two deals with the Red Army’s breakthrough of the Germans’ Oder defensive position up to the encirclement of the Berlin garrison. This covers the First Belorussian Front’s difficulty in overcoming the defensive along the Seelow Heights along the direct path to Berlin, as well as the First Ukrainian Front’s easier passage over the Oder and its secondary attack along the Dresden axis. The Second Belorussian Front’s breakthrough and its sweep through the Baltic littoral is also covered. Part three covers the intense fighting to reduce the city’s defenders from late April until the garrison’s surrender on 2 May, as well as operations in the area up to the formal German capitulation. This section contains a number of detailed descriptions of urban fighting at the battalion and regimental level. It closes with conclusions about the role of the various combat arms in the operation. Richard W. Harrison earned his undergraduate and master’s degrees from Georgetown University, where he specialized in Russian area studies. He later earned his doctorate in War Studies from King’s College London. He also was an exchange student in the former Soviet Union and spent several years living and working in post-communist Russia. Harrison has worked for the US Department of Defense as an investigator in Russia, dealing with cases involving POWs and MIAs. He has also taught Russian history and military history at the college and university level, most recently at the US Military Academy at West Point.Harrison is the author of two books dealing with the Red Army’s theoretical development during the interwar period: The Russian Way of War: Operational Art, 1904- 1940 (2001), and Architect of Soviet Victory in World War II: The Life and Theories of G.S. Isserson (2010). He is also the translator and editor of The Battle of Moscow 1941-1942: The Red Army’s Defensive Operations and Counter-Offensive Along the Moscow Strategic Direction (2015). He is currently working on a history of the Red Army’s high commands during World War II and afterwards. Dr. Harrison lives with his family near Carlisle, Pennsylvania.